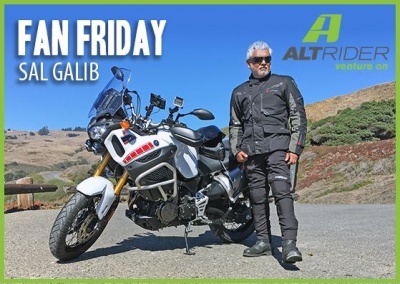 Our featured fan this week is Sal Galib from Oakland. Thanks for sharing your story with us Sal, venture on! "After I purchased my Yamaha Super Tenere, I was considering Touratech products since I had great experience with them on my BMW. While doing some diligent internet searches for alternative products, I came across AltRider Products. I love how well made, easy to install and well designed the AltRider products are and I'm glad I made the switch. I currently do have the crash guards, universal joint guard and rear brake master cylinder guard on my motorcycle. I ride a 2013 Yamaha Super Tenere for adventure rides. My recent adventures were Yosemite, Mono Lake, Mammoth Mountain and Sonoma coast".